Drawn to illustrate the first Shanghai Incident! 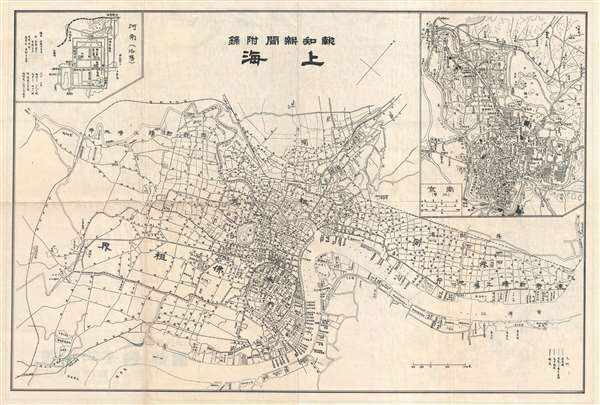 This Showa 7 or June of 1932 map depicts the city of Shanghai, China. This map was issued as a supplement to Hōchi Shinbun (報知新聞) on the 11th of February, 1932. The first 'Shanghai Incident' between the Japanese and Chinese forces having begun on days before on the 28th of January. The Shanghai map includes a map of Nanjing on the upper right corner and a map of Luoyang on the upper left corner. On the verso, there is a map of the lower Yangtze region. Yubin Hochi Shimbun (1872 -1942) (Mail Reporting News) was an important Meiji era government sponsored newspaper founded in 1872 by the important Japanese statesmen, politician and business map Maejima Hiskoa. The Yubin Hochi Shimbun simplified its name to Hochi Shimbun in 1894. The newspaper merged with another paper, the Yomiuri Shimbun in 1942. Hochi Shimbun, Supplement, June 11, 1932. Very good. Verso repair of fold separation. Map of Yangtze region on verso.